Land Ho! Imagine these were the first words uttered by our country's European discoverer, Christopher Columbus. He was a trader and an explorer who hit the seas at 14 years of age. He actually discovered the Bahamas,but since he believed that he had reached the Indies, he called the people "Indians" (but they were really Bahamians.) Just goes to show that most people, no matter how great they are, are simply idiots somewhere along the way. Columbus happened to be in action on the high seas. And because Queen Isabelle of Spain had the hots for him, he was sure to keep himself in her good graces. He had carte blanche all over the world and not only did he captain the Nina, the Pinta and the Santa Maria he wasn't called Cristobol Colon for nothing. Our man Columbus actually had passionate love affairs with many great, ruling women of the world keeping his voyages cutting edge. After all, we're all a little bit like Columbus on the high seas, searching for something that we don't know we'll find, but we're ever hopeful. Now, Columbus Day teaches the idea of patriotism. The fact that Columbus was originally European doesn't matter. The fact that the person we credit with being the "first American" was actually a paid explorer doesn't matter either. The fact that he called the natives of the land "Indians" because he was so disoriented upon arriving doesn't matter in the least. In fact, the only thing that really matters is that Columbus is a hero! Because if he wouldn't have found America, who would have? Magellan? Preposterous idea! Amerigo Vespucci? Close, but no cigar! Maybe 007 could have done it cause he was great with the ladies too but Columbus is our man! Remember, ladies love heroes. Since we don't really do anything on Columbus' Birthday except celebrate the discovery of America on October 12, 1492, let's get some cards circulating out there for the man. This is BIG! After all where would we be if Columbus hadn't found us our home? There is no better way to support our country than with a Columbus Day Ecard, for the great man who founded our country and kept so many noble, women happy. What could be a higher goal brought to you by Rubber Chicken Cards? 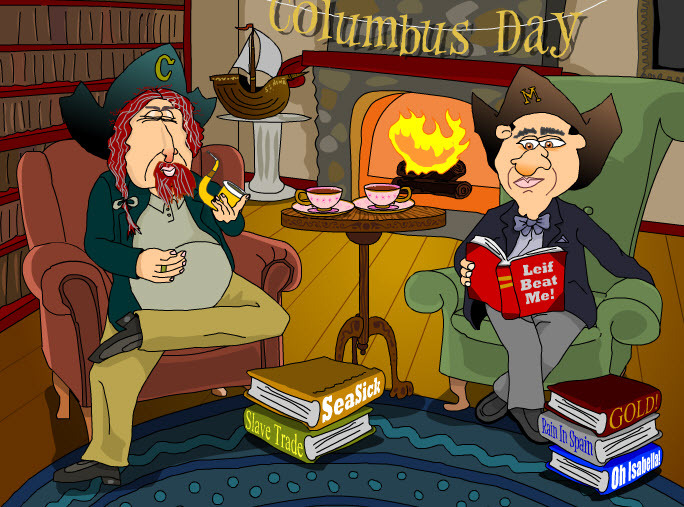 A few pointers before you go hog wild and start sending out Columbus Day Ecards to all your friends and their dogs: Columbus Day is not officially celebrated in Hawaii, Alaska, or South Dakota, so be careful.